Bridging the Digital Divide investigates problems of unequal access to information technology. 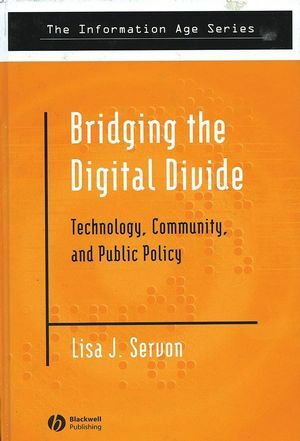 The author redefines this problem, examines its severity, and lays out what the future implications might be if the digital divide continues to exist. Examines unequal access to information technology in the United States. Analyses the success or failure of policies designed to address the digital divide. Draws on extensive fieldwork in several US cities. Makes recommendations for future public policy. Lisa J. Servon is Associate Professor of Management and Urban Policy and Associate Director, Community Development Research Center, Milano Graduate School of Management and Urban Policy, New School University. Her work focuses on urban economic development and urban poverty and her first book, Bookstrap Capital: Microenterprises and the American Poor was published in 1999. 1. Redefining the Digital Divide. 2. The Dimensions of the Digital Divide. 3. The Role of CTCs within the Community Technology Movement: Marla K. Nelson, Rutgers University. 4. Support for Bridging the Gap. 5. Community Technology and Youth. 6. Training Disadvantaged Workers for IT Jobs. 7. The Organizational Divide: Josh Kirschenbaum and Radhika Kunamneni, PolicyLink. 8. Building the Bridge: Learning from Seattle. 9. Toward a New Agenda. Appendix 1: Research Strategy and Methodology. Appendix 2: Community Technology Survey. Appendix 3: Analysis of Survey Results. Appendix 4: World Wide Web References.